In the mountains there is quite simply no replacement for a good Wall Tent and an Outdoor Wood Stove to keep yourself warm and dry. Dome tents can be inexpensive and easy to set up. You can often heat them with a propane heater and some of them are even tall enough for you to be able to stand up in to put your pants on. But I can never seem to dry my clothes with propane heat and when I am chilled to the bone, I can never get truly warm in a dome tent. Give me a wall tent with an outdoor wood stove any day. I am going to be warm and comfortable, my clothes are going to be dry in the morning and I can easily cook a meal and have hot water whenever I want it. Additionally wall tents give you a lot more space to stand up, move around, get dressed and generally set up a nice camp. And the wall tent doesn't have to be heavy to give you this room. Montana Canvas offers wall tents in Relite material, which is about a third the weight of a canvas wall tent. And if you like the looks of a canvas wall tent, but want to reduce the weight, try a Montana Blend wall tent, where the roof is made of canvas and the walls are made of Relite. This wall tent weighs half of a canvas wall tent. 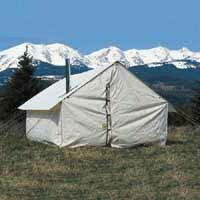 if you would like to know more about these options, read more about wall tent materials. Lastly, wall tents offer you a lot more options to configure the size and layout of the tent to best suit your needs. Regarding heating the wall tent, I always bring an outdoor wood burning stove like a Riley Wall Tent Stove or a Cylinder Outdoor Wood Burning Stove. Wood burns hotter and drier than propane. It smells better, feels better and can be safer. Outdoor wood stoves are available in lightweight designs for those of us who pack in and in heavier gauge steel for those who prefer it. And there is no more welcoming sight after a day's ride or a day's hunting than to come back to camp and see a cozy wall tent with a warm fire in the wall tent stove waiting for you. Now that I have hopefully convinced you that a wall tent with an outdoor wood burning stove is the way to go, here are a couple of tips you might want to remember when it is time to set up your wall tent. Never set your wall tent up under a snag (standing dead tree). If the wind picks up during the night, you don’t want to lose sleep wondering if that snag is going to blow over on your cabin tent. In fact, if there is a dead snag close to where you want to set up, cut it down for fire wood. I learned a long time ago that trees lying on the ground may look perfectly dry, but it is the rare one that will give you enough BTUs to boil water. If you can help it, don’t set your wall tent up out in the meadow where the view is great. You will be much happier setting up in the trees where there is some protection from the elements. I am often asked how much snow load a cabin tent will take. Forget it. Wall tents are not made to set up in snow country and go off and leave them for any length of time. Someone has to get up and beat the snow off the roof occasionally. Some wall tent frames or good lodgepole setups will give you some time and you might even get a dry snow to slide off your fly, but a heavy, wet snow will collapse a wall tent pretty quick, so keep a close eye on the conditions when the flakes start flying. And another little tidbit…throw a couple of mousetraps in with your plunder. Most cabin tents and wall tents aren’t mouseproof and you haven’t lived until you wake up in the middle of the night with one of those furry little critters sitting on the end of your nose! One last thing…any seam on your wall tent has literally thousands of holes from being sewn. Most of these will seal up, but some may not. For this reason and many others, I strongly recommend putting a wall tent fly over your wall tent. In addition to protecting against leaks, wall tent flies also help insulate your wall tent, keeping it warmer and drier inside. They protect your roof against sparks, debris and weather. Wall tent flies extend the drip line to about a foot away from the tent walls. This extension plus the roof protection is a huge bonus, especially with a wall tent with a canvas roof, because it keeps the canvas dry. This saves you a lot of time and hassle drying out your canvas wall tent when you get home, not to mention many pounds of added weight from the water absorbed by the canvas. A 14 x 17 canvas wall tent is heavy enough without soaking it. 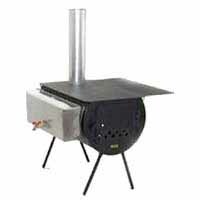 When it comes to outdoor wood stoves, there are many on the market made specifically for use in tents. The better stoves are typically made of heavier steel, but these are not packer friendly. If you are packing in to your camp site, the outdoor wood stoves made of sheet metal are lighter weight by about half and just as good. Regardless of the models, most outdside wood stoves are available with accessories such as warming shelves and water heaters. What outdoor wood stove do I use? I am a packer, so I use the Riley Little Amigo in my 10 x 14 Relite wall tent. I use both the warming shelf and the wood stove water heater. The shelf doubles the available space for cooking. The wood stove water heater is a space saving, efficient way to have hot water available at any time. A wood stove water heater not only leaves your entire cook top free, but actually extends it a little as the tops of most wood stove water heaters are flat. I also use the Outfitters Supply™ spark arrestor because it is easy to install and easy to clean when necessary. I strongly recommend using a good spark arrestor in conjunction with a wall tent fly to protect your wall tent against sparks and embers. Cooler weather doesn’t mean we have to stop packing and camping. Remember that the important thing is to enjoy yourself. A wall tent and an outdoor wood stove will keep you warm and dry, even if it gets below 0 degrees, and can offer you the opportunity to enjoy the backcountry early in the spring and long into the late fall.